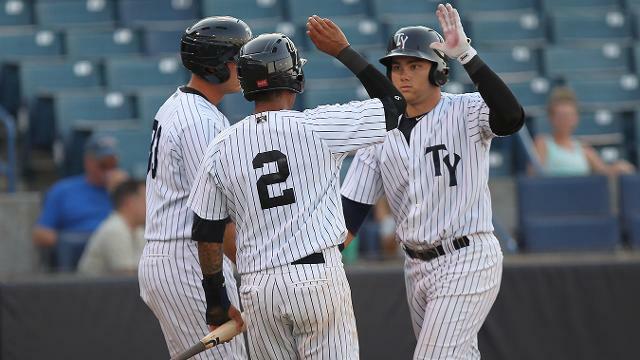 TAMPA, Fla. - The Tampa Yankees (25-22) scored 9 runs on 14 hits as the bats came alive in a 9-6 win over the Jupiter Hammerheads (22-26) on Friday night at George M. Steinbrenner Field. Despite four fielding errors in the finale, the T-Yanks salvaged a split in the series. Cito Culver and Dante Bichette Jr. led the way for Tampa. Culver went 4-for-5 with three runs scored and two runs batted in. Bichette knocked his fourth home run of the year, going 3-for-5 with five RBI. Southpaw Eric Wooten got the start for the Yankees and lasted five innings. Wooten allowed five runs (three earned) on nine hits and a walk, striking out two. Jupiter sent nine batters to the plate in a four-run third. With runners on the corners, Colin Moran delivered an RBI single. Two outs later, Matt Juengel hit an RBI single to center. Jesus Solorzano followed with a base knock to left. A misplayed ball by Grice in left allowed a run to score. Terrance Dayleg the reached on an error by Culver at shortstop, letting one more run score and giving the Hammerheads a 4-0 lead. The Yankees responded with a run in the home half of the third. With one out, Claudio Custodio singled and stole second. A base hit by Jake Cave placed runners on the corners before Culver hit an RBI single to center. Moran belted a home run over the Walgreens Deck in right field as Jupiter took a 5-1 lead in the top of the fourth. Tampa tied things up in the fifth. Grice led off with an infield single. One out later, Cave doubled down the left field line. A single by Culver scored Grice and advanced Cave to third. Greg Bird delivered a sacrifice fly to center, plating Cave.Bichette then doubled to left-center field, scoring Culver. After a walk by Matt Snyder, Zach Wilson tied the score with an RBI ground-rule double to center field. Hammerheads starter Josh Hodges allowed five runs on eight hits and two walks, striking out one. The Yankees rallied to take the lead against RHP Brian Ellington (0-1) in the sixth. With two outs and none on, Culver singled and stole second. Bird drew a walk, setting the stage for Bichette. On the first pitch, Bichette sliced a fly ball over the right field wall for a three-run home run, giving Tampa an 8-5 lead. Jupiter tacked on an unearned run in the seventh. Juengel reached on an error by Bichette at third. A wide pick-off throw by RHP Stefan Lopez allowed Juengel to reach third before a sacrifice fly by Solorzano scored him. Bichette made up for his error by delivering in the eighth. Culver led off wit ha double and Bichette drove him in with a single to right field, giving the Yankees a 9-6 cushion. LHP James Pazos struck out the side in the ninth, earning his fourth save of the year. Nick Goody earned the win for Tampa. The righty yielded a hit and a walk and struck out two in a scoreless sixth. Cave extended his hitting streak to 10 games, going 2-for-5 with a double and a run scored. Garrison saw his streak end at 10 in an 0-for-3 night. Up next, the T-Yanks hit the road for three games in Brevard County against the Manatees. Due to a rainout on May 2nd, a double-header is schedule to begin at 5:05 p.m. on Saturday. Yankees' LHP Dan Camarena (3-3, 2.47 ERA) will square off against righty Damien Magnifico (3-3, 2.37 ERA) in game one of the twin bill. The next home game for the Yankees will be on Tuesday, May 27th against the Bradenton Marauders. Every Tuesday home game, fans can Buy 1 Ticket, Get 1 Ticket FREE and get "2-for-1"scooter dogs, small popcorn, peanuts, small sodas, programs and speed pitch. Half price bottled beer from 6:00-8:00pm. Silver Slugger members receive FREE admission.